If there is any government workers reading this, you might have some relief if you are reading this in a dated browser. At the latest town hall meeting, Secretary of State Hillary Clinton was questioned on the update roll-out of secure, state-certified browsers and -- prefacing with a chuckle -- she announced that Google's Chrome had started already begun its roll-out last month. 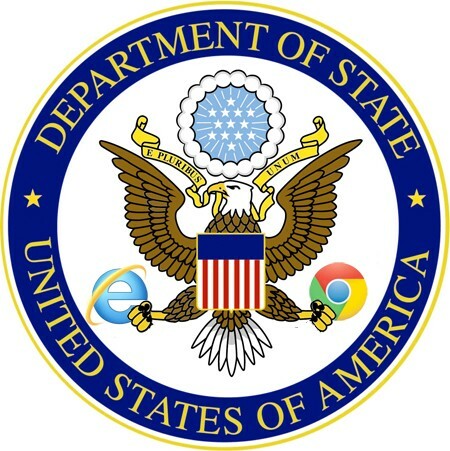 For now, it's an optional web browser for those not enamored with Internet Explorer -- the only browser compatible with the full breadth of the Department of State's IT system. Governmental workers that are fans of that big blue 'e' also got some good news -- they'll be seeing the roll out of Internet Explorer 8 from March 20th, with the department planning to leap over version 9 and straight into the loving embrace of Internet Explorer 10. On another note, anyone who reads this site will have real slow loading on any browser that is IE8 and/or the versions before it. It already takes a few seconds just to render the backgrounds of the post widgets, so that already shows how dated IE8 and below is. IE9 is far better, but still has little CSS hiccups here and there.